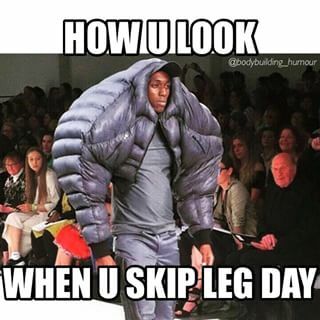 That fabric, those flappy pieces of whatever on the front arms, that squattable height. UGH! 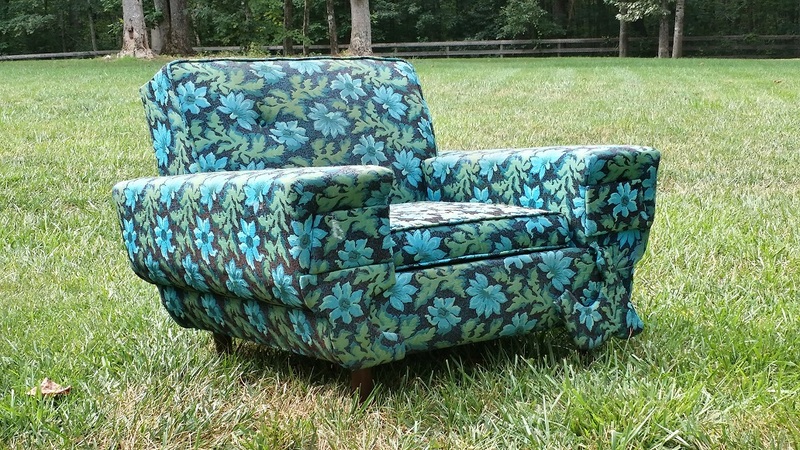 This chair was certainly an ugly duckling. I originally purchased it off Craigslist last year and it has sat in my basement since then. 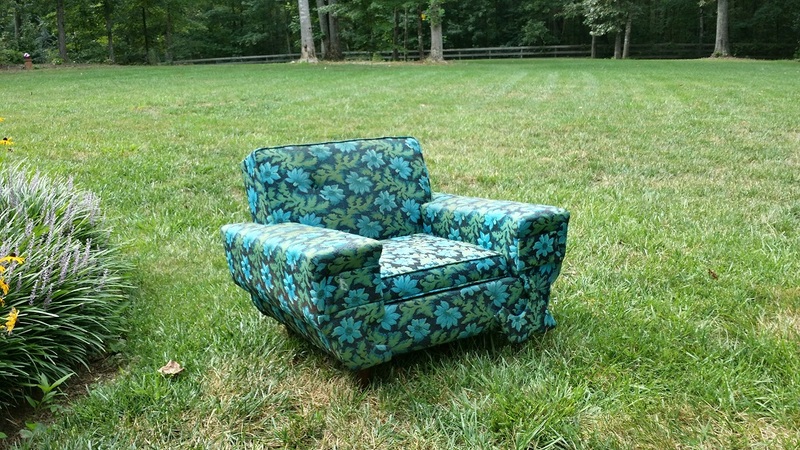 That's were all my old, ugly furniture goes...my dirty, little secret. 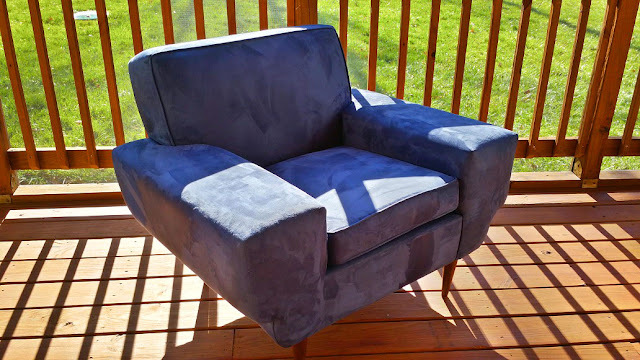 I decided on a dark blue microfiber, as it was very durable and reasonable in price. 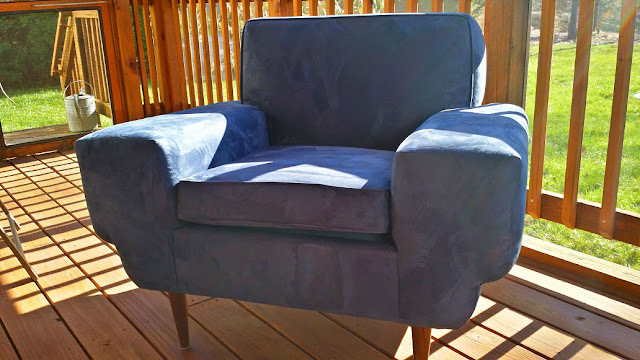 I was initially looking at velvet or mohair, but I wasn't feeling it and I think that it would make the already beefy chair look more bulky. I hindsight, I might have gone with a more masculine, weave-type fabric like tweed to make the chair look more unique, but for a no-name, mid-century ugly duckling, this is a HUGE improvement. Besides updating the fabric, springs, cushions and padding, I changed out the old legs to these beautiful, walnut ones I purchased from a craftsman in Vermont. It sounds fancy, but the price was extremely affordable. 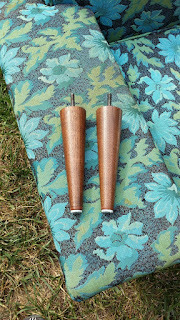 The old legs were pretty beat up and were missing some of the ferrules. Plus, the old legs were only 5 1/2" long and made it hard to even sit in and get out of the chair, so I had the new legs made at 7". 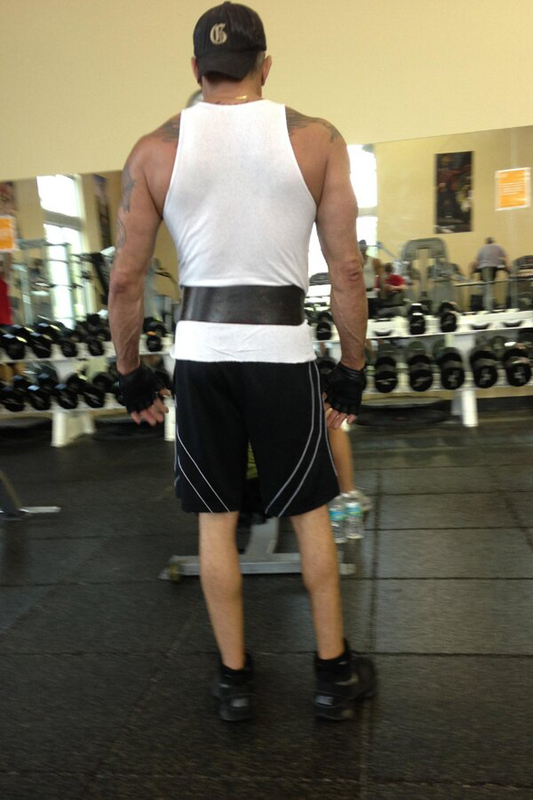 I am still on the fence if these legs are TOO long. I dunno...I reached out to some of my peeps on Houzz for feedback and it's been mixed. What do you think? Are the legs too long? As it is, the chair kinda reminds me of one of those bodybuilders who forgets leg day at the gym. 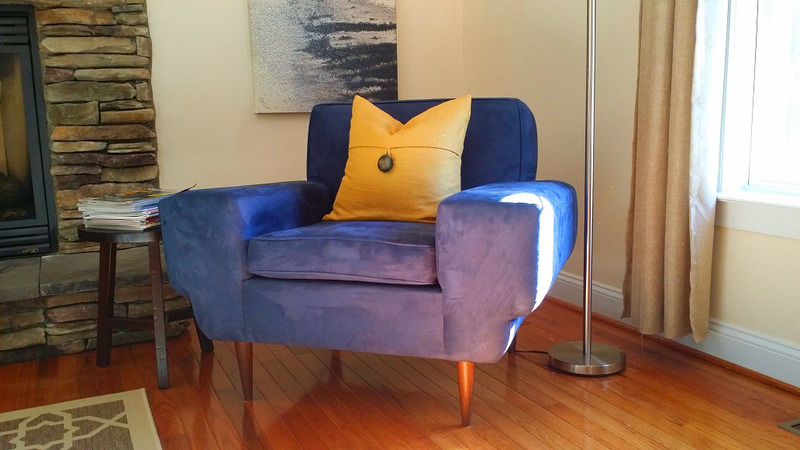 The seat height is 19" at the top of the cushion and it is comfortable to get in and out of. 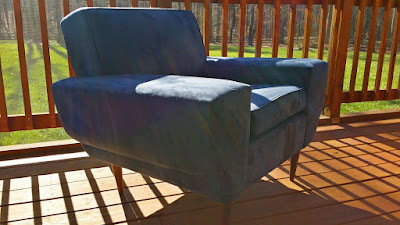 I've thought of either shortening the current legs by 3/4" or ordering newer, bulkier legs to match the chair's style. For now, it is growing on me and I do love it. But overall, I am thrilled with how it came out. 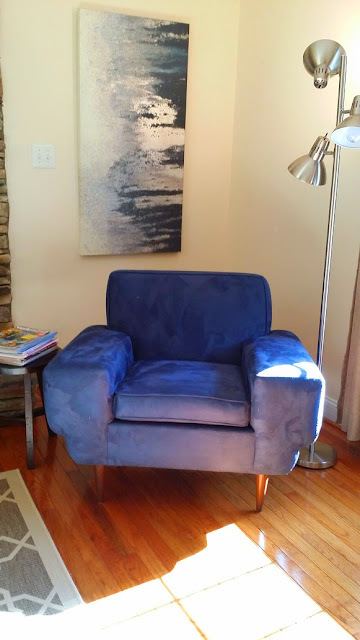 It was a little more expensive to have done than my last chair, but I definitely paid less than what I would have for a real, reupholstered mid-century chair from a showroom or designer. 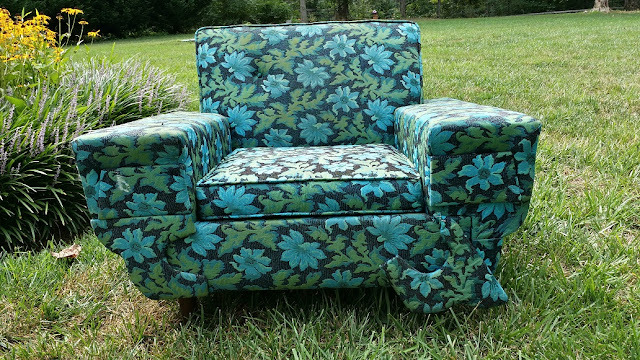 The chair is beautiful - just my style. On the blog, the legs look fine. In person might be different. Getting in and out of the chair comfortably is a HUGE reason to leave the legs at the current height. Your chair and you look at it every day so what pleases you is what matters most. Thanks Mary! It's growing on me and I think I'm going to leave it as it is.